When George Lucas sold his industry-changing company to Disney, Lucasfilm began a new era in the Star Wars Universe in earnest with plans to make a brand new trilogy following up on the events of Return of the Jedi. With newcomers JJ Abrams and Michael Arndt alongside returning writer Lawrence Kasdan, Star Wars: The Force Awakens established new players and conflicts in the struggle between the Light side and the Dark. But while George Lucas had meticulously mapped out the trajectory of his prequel trilogy—having to end the events so that they’d neatly dovetail into the original Star Wars movie—the new series has been planned much like the creator’s original movies. Rian Johnson was hired to write and direct the followup to The Force Awakens, revealed to be called Star Wars: The Last Jedi earlier this year. And though it might have seemed like Lucasfilm president Kathleen Kennedy and the Story Group has a thorough roadmap for where these films need to go, the Episode VIII director revealed he was able to create and tell the story that he wants unencumbered by plans for the future of the franchise. @Bogwing I’m sure they talked about where it might go early on, but when they came to me there was no mapped story presented beyond TFA. Jurassic World’s Colin Trevorrow will take the reins from Johnson, directing and handling the script with his writing partner Derek Connolly. Though it was rumored Johnson wrote a treatment for the film, The Last Jedi director recently revealed that Trevorrow and Connolly would be working from scratch and craft their own film. Though the news that these filmmakers are working without an overall plan for the characters in the franchise might worry some—did Abrams and Co. know who Rey’s parents were, or Snoke’s identity, or why Ben Solo became Kylo Ren? !—it’s not an unprecedented process even in the Star Wars Universe. Lucas himself had abandoned his original plans for the sequel, which could have been the Alan Dean Foster-penned novel Splinter of the Mind’s Eye had the first movie not been successful. It was only in later drafts of what would become Empire Strikes Back that Lucas concocted the story of Darth Vader being Luke Skywalker’s father, being swayed by a Sith Lord who would become the Emperor. Lucas didn’t even finish the script for Return of the Jedi until late in the pre-production process. Instead of being worried that Lucasfilm is working without a parachute, be encouraged that they’re allowing filmmakers to tell the stories they want. After all, the Lucasfilm Story Group isn’t there to give Johnson and Trevorrow roadblocks, they’re there to make sure everything else lines up to what the directors are trying to achieve. Star Wars: The Last Jedi premieres in theaters December 15. Are you excited for the next film in the sequel trilogy? Let us know with your vote in the Anticipation Rankings below! Star Wars: The Last Jedi is the second film in the new Star Wars sequel trilogy that began with Star Wars: The Force Awakens in 2015. The film will deal with Luke training Rey to become a, and possibly the last, Jedi. Meanwhile, the Resistance, including Poe Dameron and First Order defector Finn, continues to fight against the First Order, led by General Hux, while Supreme Leader Snoke and his Dark Side follower Kylo Ren continue their mysterious plot. 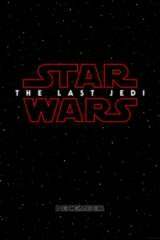 Star Wars: The Last Jedi is written and directed by Rian Johnson and stars Mark Hamill, Carrie Fisher, Adam Driver, Daisy Ridley, John Boyega, Oscar Isaac, Lupita Nyong'o, Domhnall Gleeson, Anthony Daniels, Gwendoline Christie, Andy Serkis, Benicio Del Toro, Laura Dern, and Kelly Marie Tran.